Aurora’s Paramount Theatre is winning the hearts of generations with its current smash hit, Annie. In addition to spreading the word about this wonderful show, we are also helping Paramount build awareness for its unique community relations efforts associated with everyone’s favorite rags-to-riches musical. First, click this recent feature in the Aurora Beacon News, a holiday heart-warmer about actor and professional dog handler Brian Michael Hoffman. Brian appears on stage in every performance and is the primary caregiver of Mikey, a rescue dog who has been carefully trained to play Annie’s canine friend Sandy. 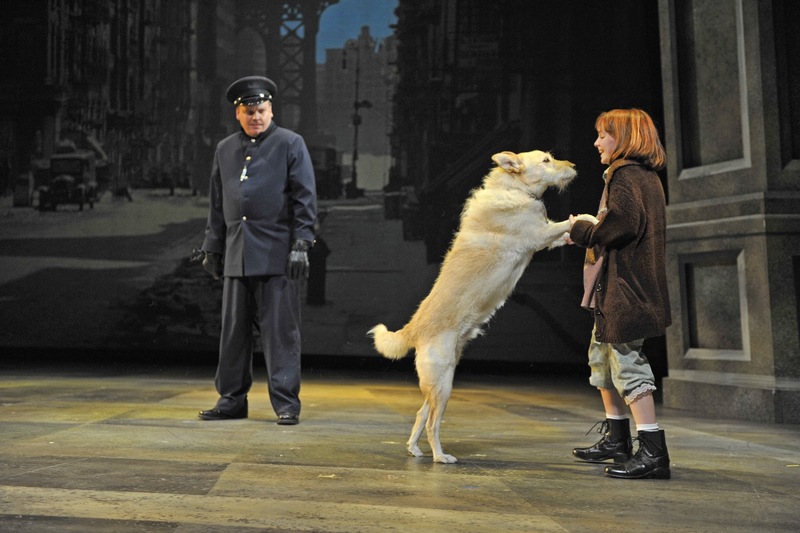 Brian convinced local pet adoption agencies to bring a stray dog to each show to make a live, on-stage appearance during Act One. Then, the lucky duck, er, dog, gets the chance to meet and endear itself to potential new owners in the lobby during intermission. Already, two dogs, Whiskers and Tootsie from Rover Rescue in Aurora, have found new homes with Paramount audience members through this wonderful outreach program. By the way, did you read the reviews? Both the Chicago Tribune and Chicago Sun-Times agree Paramount’s Annie is better than Broadway’s! Performances run through December 30, so don’t wait until “Tomorrow!” Get your tickets today!